I'm still working on getting my stuff down, little at a time. But I also took advantage and bought that pack you mentioned. Haven't had a chance to use it yet. And I watched that Dang video with the tent too!! I don't think I could do a bivy. I saw Mary's when Trish, I and Mary did Haunted Canyon, too confining for me. I saw a post from BOYNhisDog about a year or two back with a pic of what he used and I liked his set up. But I think it was a self made tarp and some kind of mesh but the whole side was open, much like this tent. But it sure looked pretty similar to the tent in the video. I've been looking for something like that since I saw BOYNhisDog's post. God only knows I need/want to bring my pack weight down. I'm just keeping at it, little at a time, I'll get there. Tommy had his pack at the March GHOTM and was discussing his gear for his upcoming venture on the PCT, so I'll gleen help wherever I can get it, to help me. Good thing I only have 1 hiking pole left, now that gives me an excuse to look for something new and light . the REI UL carbon adjustable poles combined with the GG "the ONE" shelter would be a beautiful thing, indeed. I have been going ultralight for several years now. Maryphyl -- What is usually in your pack ? Since I am also trying to get lighter in my backpacking, I checked out the packs Mike mentioned in his March posting: Gossamer Miniposa, ULA Amp, GoLite Jam2 and GG Vapor Ki......Seems like there is only one that fits short torsos <14 inches. The GG short fits 15-18", the GoLite short is 16-18", ULA Amp is 15-18". The Miniposa is the only one that fits <14". It was suggested to me to buy a youth's pack but they weigh the same as my current Kelty. I guess no manufacturer thinks that munchkins actually backpack. they have adjustable back panels on some of their packs and you might see something you like. here's one and the "kids prophet" is even smaller. I think the X-small Exodus pack will work for you. Because these are frameless packs, there is quite a bit of fudge room. *meaning you can take it down to less than the recommended torso lenght. But hey, nothing wrong with chocolate either. Nice suggestion but checking out the sizing, X-small fits 17"+ (?? WHERE do they get this sizing from????) and 5'2"-5'6" and that doesn't fit my stats. How many 5'2" people have a 17" torso???? And at $170, it better fit like a glove, feel like a massage after 8-10 miles and come with a lifetime supply of chocolate. The kids Prophet fits 14" and up. So neither one will fit me. But thanks for the suggestions. I now carry a Granite Gear Vaport Ki (S) -- fits well and is much lighter. My torso is short but in general a small pack works well. he might be able to help you on your quest. he made the smaller "blast" for me at a special request. one of these days some of us veteran UL folks will have to post some of our pack lists to aid in the aspiring UL'ers goals. Then again, Fairweather's pack list is a great place to start. Everything listed is all you (should) need to stay warm, dry, well fed and hydrated. First Law of Gravitational Dynamics: less weight=less weight=less weight and so on. Good luck and godspeed on your endeavors. How much food do you carry per day ? I have heard 1lb/day (ensuring adequate calories intake ofcourse) is a good rule of thumb. My biggest weight overage comes from snacks -- What do UL folks carry by way of snacks ? One area where I can look to reduce weight us with the tent --but I am partial to a fully enclosed tent that keeps me DRY! Every long backpack trip has been blessed with at least 1 rain/snow/mega-wind day - I think I will look into lighter 2 person + gear space tents . I am sure I can trim down the 4lbs (for a 2 person tent) I am at. I also think its easier to go lighter in summer! i carry food that packs at least 100 calories per ounce. base that on distance, amount of elevation change and other conditions and about 3000 calories works for me-on average (per day). always try to use high energy (calorie) food. hauling along a 4oz pack of Tuna that only gives you 170 calories is a good way to lose weight. Try a 3oz ProBar instead, 370 calories per bar. What do UL folks carry by way of snacks ? Pro'lly the same thing you carry. I like ProBars. something I didnt count was a plastic grocery bag for carrying food. but hey, thats like a gram or something. first aid kit contains Ibuprofen, matches, bandaids, 2 safety pins, some spare batteries, dental floss, toothbrush, some duct tape, a Fox whistle and a couple of chlorine tablets. In a spinnaker stuff sack. 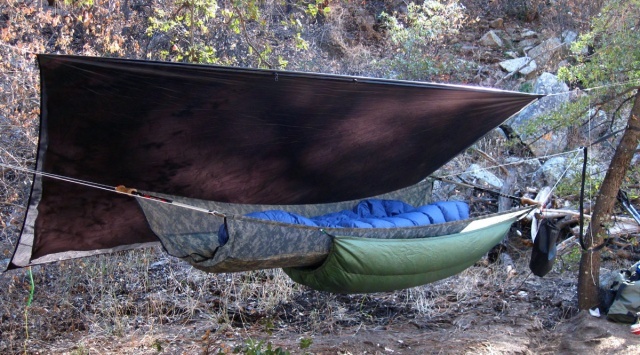 Sometimes the need for a tarp over the hammock isnt there so that stays at home. That alone knocks off another 9 ounces for the tarp, tensioners, guyline and stakes. Yes - Probars are my favourite trail food now. They taste real good and are calorie dense. I think I am going to go back to Enertia Trail foods --small light packs and calorifically rich. How do you manage with just 2 liters of water in summer? I stay the hell away from the Supes! usually where I go b'packing there are plenty of water sources. Since trails are generally routed to/near springs and seeps, its usually no farther than 10 miles at the most between reliable water. Think about the Cabin Loop as an example.